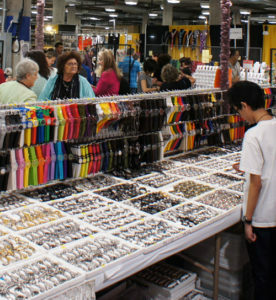 The Mid-South Jewelry and Accessories Fair is a cash and carry show as well as order writing. This popular Midwest market made its debut in 1974 in Memphis, Tennessee and has become a Must for wholesale buyers from this region. This market attracts 5,000 buyers and has 250 booths. The Mid-South Jewelry and Accessories Fair, August 10-12, 2018, is held at the Landers Center (NEW LOCATION), Arena, 4560 Venture Dr., Southaven, Mississippi. We’re opening our show floor to the General Public on the last day of the show — Sunday, August 12. » 12–15 years get free entrance! » 16 years and up, $15 + $1 processing fee per person per show day. On PUBLIC DAYS only, must be 12 years or older to access show on Sunday. Proof of age is required. 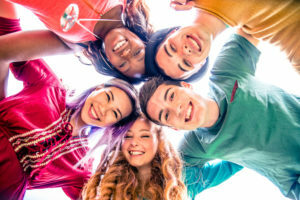 All minors under the age of 16 must be accompanied by an adult. Helen Brett Ent. has the right to deny entrance. GOLD CARD BUYERS AND NON-GOLD CARD BUYERS - If you attend the Mid-South Jewelry and Accessories Fair after 2 p.m. all days, your guests will get in for $10 (plus $1 processing fee) per guest. Make plans to bring your children and older grandchildren to our Mid-South Jewelry and Accessories Fair. It's a great way for you to "pass the torch" to the next generation and spend quality time with your children and older grandchildren as they get to participate first hand in negotiating of prices, purchasing wholesale and identifying quality products. Two future buyers per company, ages 12-21, are invited to attend the show FREE of charge when accompanied by a qualified buyer. Documents needed at registration: birth certificate, school ID, or government ID. The Helen Brett Buyer's Gold Card is a convenient method for a buyer to remain qualified to attend all Helen Brett shows for a two year period. Bring your ID and valid Gold Card to gain quicker admittance to all the shows. Gold Card Members also receive additional benefits. *All Gold Card Members are eligible to bring TWO guests per day of show for the $15 guest pass fee. All Non Gold Card members are eligible to bring ONE guest per day of show for the $15 guest pass fee. Every guest pass can be used for entry all days of the show. Must be 16 years or older to access the show floor on Friday and Saturday. Must be 12 years or older to access show floor on Sunday. All minors under the age of 16 must be accompanied by an adult and infants must be in carrying pack. No wheeled carts of any kind, or strollers will be allowed on the show floor. Wheelchairs, walkers, and mobility scooters are permitted. Helen Brett Enterprises has the right to deny entrance. Helen Brett Enterprises has reserved a block of rooms at the following hotels for the Mid-South Jewelry and Accessories Fair. This rate is available through July 9, 2018. To receive this rate, please make reservations online, or call 1 (844) 641-1114 for room reservations. Be sure to mention Block Code HBT. This rate is available through July 18, 2018. To receive this rate, please make reservations online, or call 1 (662) 996-1500. Be sure to mention Helen Brett Show. To receive this rate, please make reservations online, or call 1 (662) 996-1480. Be sure to mention Helen Brett Show. When making reservations online please scroll down for Courtyard Southaven Hotel.